Large-framed mare for amateurs and girls. She is already experienced around courses. Several times placed 1.10 m, winner 1.20 m, placed 1.30 m.
Very promising young horse, scopey and careful. Amiable horse, quick learner. Ready for 1.10 m and 1.20 m classes. A model student with a lot of talent at the jump. Very easy to ride. Wins and placings in 1.10 m. Hunter prospect for almost any rider. Winner 1.10 m class and several placings with scores in the 8 range. 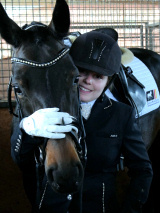 Easy show jumper, good contact, ready for 1.20 m.
Refined mare, placed numerous times in 1.30 m, 1.35 m and 1.40 m class. Ideal for speed jumping, potential for higher levels. Particularly suitable for children and juniors. Refined, eye-catching chestnut by Quaid I. 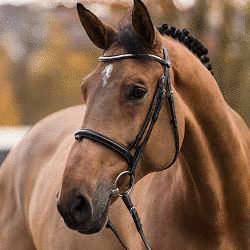 Attractive sport horse for show jumping and hunter ring.